Note: there is a "Nortel" label on the front of this set. This multi-line, digital phone is ideal for main answering points, busy administrators or anyone who prefers the one-touch convenience of accessing a wide range of features. The number of lines and/or one-touch feature capabilities can be further increased by combining it with the #M522 Add-on module for an additional monthly fee. The monthly cost of the phone includes the instrument, the lease of two-four lines, touchtone service, distinctive ringing, and the built-in features listed below. 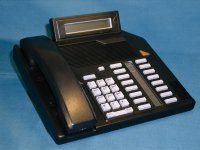 *NOTE: Direct Inward Dial (DID) telephone numbers and the Call Transfer/ 3-Way Conference (3WC) feature are automatically installed when ordering this phone. Each DID number costs $1.25 per month and the 3WC feature costs $0.50 per month. One-time order fees apply when ordering this phone. All prices are subject to change.